The New Zealand Winter Games was big news across the winter sports when launched back in August 2009. 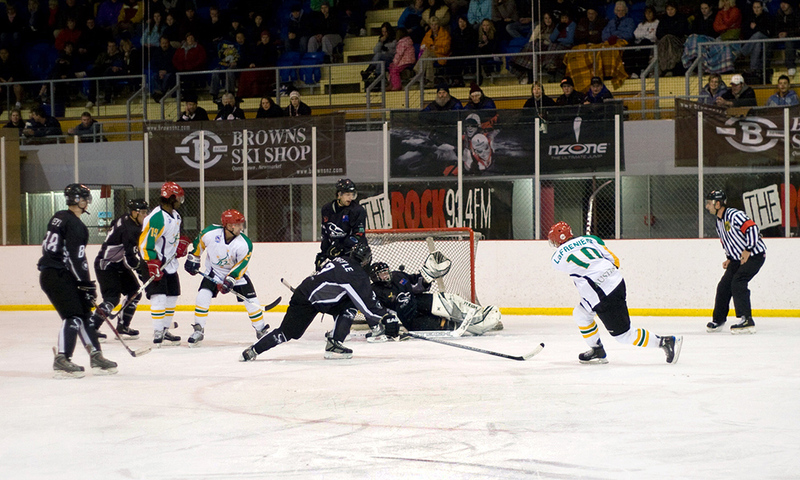 The inaugural Games included an ice hockey tournament of two games between Australia and New Zealand in Dunedin, well away from most of the event’s focus around Queenstown. The event was significant, however, with Sky Sports covering the games with commentary and multiple cameras, and the weekend gave the Ice Blacks their first ever win against Australia, although this team was not the Mighty Roos we know them as today, which I’ll explain a little later. The New Zealand Winter Games are definitely an exciting event for the Australian winter sports enthusiast. But for our ice hockey players, it comes at a bad time – in the last round or two of the Australian Ice Hockey League season, a time when teams can’t afford to give up their key players or risk injuries one week prior to their AIHL Finals series. Bob LaJuenesse of Australia chases Chris Eaden of New Zealand in the Trans-Tasman match between New Zealand and Australia during day one of the Winter Games NZ at Dunedin Ice Stadium on August 22, 2009 in Dunedin, New Zealand. In the first few years of the Games this awkward timing was a big headache on both sides of the Tasman, and is why the 2011 visiting Australian side was the last, until now. This year the Games fall one week after the 2017 AIHL Finals, giving players an opportunity to pull on the Australian green and gold jersey against New Zealand’s Ice Blacks. The 2009 Australian Games team was actually made up with players from the Newcastle Northstars and Sydney Bears AIHL sides, including one American and three Canadian imports. Although, one had an Australian mother and had never claimed his citizenship while eligible to do so. If the Games were an International Ice Hockey Federation (IIHF) event, this team would not have been eligible to represent Australia. Counteracting the advantage Australia had in having four imported pro-level players was the team’s short bench. They were well short of an ideal number of players to play a full three, 20 minute period game. Brian Bales of Australia controls the puck despite the attempted defence of Corey Down during the final match between NZ and Australia during day nine of the Winter Games NZ at Dunedin Ice Stadium on August 21, 2011 in Dunedin, New Zealand. Three injuries on the Saturday night left the Aussie team down to nine skaters who were at times gasping for breath. The short bench led to a loss and then a shootout loss for the Australians. They lost the tournament to New Zealand, bringing euphoric coverage across the host country. Now in 2017, Australia faces a similar challenge against the Ice Blacks. This Australian side is IIHF eligible. In fact, the team is almost entirely made up of grassroots players, many of which wore the Australian jersey in a world championship tournament prior to the 2017 AIHL season. This year, 17 Mighty Roos will match up against 21 Ice Blacks – both teams full of players from each country’s respective national leagues. With a full 60 minute games ahead of them, the Australians will struggle with fatigue compared with the longer Kiwi bench. And the Kiwi team has closed a lot of the gap that existed between the two teams back in 2009. Joshua Hay of New Zealand shoots in the Trans-Tasman match between New Zealand and Australia during day two of the Winter Games NZ at Dunedin Ice Stadium on August 23, 2009. It’s not all gloom for the Aussies though. Most of the AIHL’s young stars lining up in green and gold are getting an opportunity to be top-line players, with many of the ex-pats who lead the regular season play unavailable for the tournament. The New Zealand team has recently gone through a generational change, with several veteran star players retiring from national duties. Plenty of threats remain for the Australians, however. For Paris Heyd, the 2009 Games were a giant step forward for the young Kiwi. Since then he’s been the country’s best performed player in both the domestic NZIHL and in IIHF tournaments. The Ice Blacks also boast Matthew Schneider, a Canadian NHL draft pick who started fruit picking in New Zealand and has since become a force in the NZIHL. The Aussie team is stacked full of defence, but lacks most of the scoring punch of the usual Mighty Roos team. This time there’s no Wahebe Darge, Lliam Webster, Joey Rezek or Cameron Todd. Australia’s only top scorer from the 2017 team that went to Romania in April is Tommy Powell, who’ll captain the team. In goal is youth pairing Charlie Smart and Nick Novysedlak. Smart was backing up Aussie veteran goalie Anthony Kimlin for the past two tournaments. Wins to the Kiwis may be hard to suffer on this side of “the ditch”, but from the reaction of the 2009 win as a gauge, these games could be an enormous boost for ice hockey in New Zealand. Imagine if they win the series 3-0! Peter is a native Novocastrian with strong links to USA, including a 6 year residency in the Seattle area where he picked up a love of North American sports. His involvement with ice hockey started in 2001, taking on roles such as volunteer writer, manager, commentator, statistician, and historian. Peter's other interest include IT, music, cycling, and more recently, triathlons.